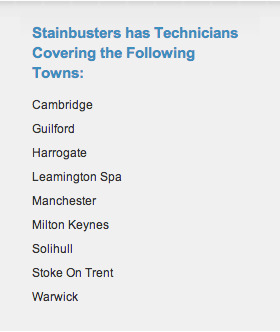 Stainbusters technicians specialise in professional carpet cleaning and are full time employees who are fully insured and have been through our background checks and strict selection process. Each team member has graduated from our advanced training course so you'll get the best results every time. We recommend that you move small objects, lamps, ornaments etc. as a precaution against accidental damage. We will move most furniture (sofas, chairs, tables etc.) as we work. Large items of heavy furniture, bookcases, entertainment centres and the like, we work around...our technicians reserve the right not to move any piece of furniture or household object that they do not feel comfortable with. Carpets will be dry one hour after completion of the standard cleaning process. Upholstery may take longer - 2 to 4 hours, depending on the backing material. Let me start by defining the difference between a spot and a stain: a spot- is any foreign material (soil, liquid, etc.) that is removable by standard cleaning methods. (The foreign material is on or around the carpet fibre) A stain- is foreign material (soil, liquid, etc.) on carpet that is not usually removable by standard cleaning methods. (The foreign material has penetrated 'soaked into' the fibre and has changed or damaged the fibre itself) Leaving some stains very difficult or impossible to remove. But don't forget our guarantee: If your stain can be removed, we will remove it. If we don't and somebody else subsequently does we will give you your money back! Carpets actually acts like a 'filter' trapping pollutants to the roots, which are then removed by professional carpet cleaning. As long as a regular cleaning schedule is maintained, carpet provides much better indoor air quality than hardwood.